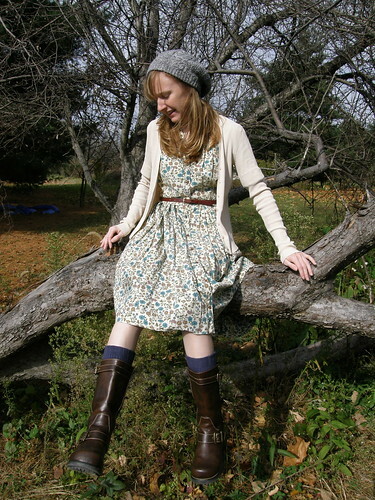 I like her brown shoes, brown tights, and brown shirt with that adorable green skirt. And that little ivory bow is soooo cute! This vintage ensemble is lovely. I love how she brown, black, creamy white, and the forest green tights. Those shoes are absolutely fabulous, btw. Ah! The coat is lovely, but the red tights and the red sleeves that peek out from underneath the coat are what totally sends me into swooning mode for this little get-up. This is so cute. Plaid dress + cardigan + amazing boots = perfect fall look. 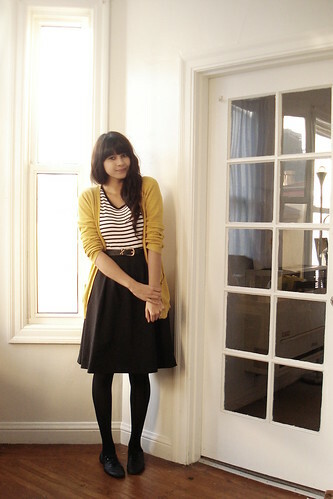 And here's another cute fall look! The belted floral dress is lovely. I think I have a thing for cardigans... because I just love them! I also adore the way her navy blue socks peek out from the tops of her boots---way too cute. Oh, and I love those types of hates... although I have a hard time pulling hat looks off. What I love about this attire is how simple and lovely it looks. 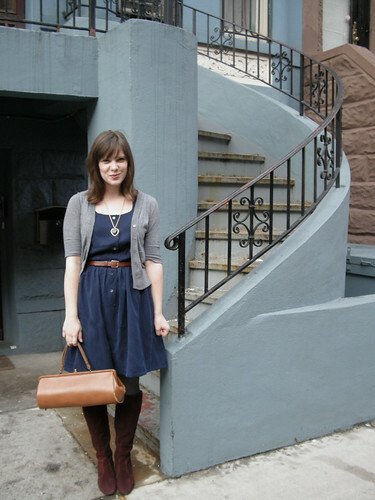 Again, I can tell that this fall I'm really into belted dresses, boots, and cardigans. 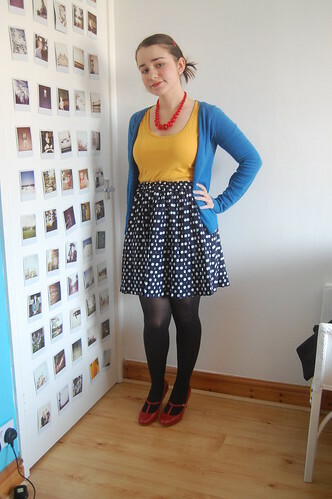 She literally "just threw this on" and I think it is gorgeous. I really like the dress with jeans. I love the boots. And that sweater looks so cozy.